orange and black by Gran, Go Pokes! 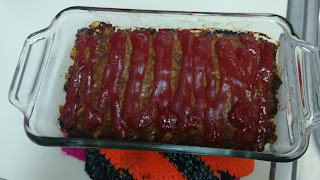 Last night I made a meatloaf at my mother-in-law's request. It's a combo recipe from Saveur Magazine (number 165) and my Gran's recipe, which turns out was borrowed from another church friend. The Saveur recipe is tasty and uses cornflakes for the binder, which makes a sweeter meatloaf -- never a bad thing to my taste buds but not the best for managing my health! It also uses a small yellow onion minced, but I found when I use that it's even better to grate it into the loaf so it melts in fully. The easier tweak is to just use the soup mix. The Saveur recipe calls for ground chuck and veal, although I honestly have never bought veal. I've had the best success with meatloaf mix. I can't always find meatloaf/meatball mix at my grocery store (it's the worst but conveniently located and I'm addicted to the gas rewards), but when I do it makes the best tasting loaf. I think it's beef and pork, but it might have a third thing. Last night's meatloaf was straight beef and it turned out OK, although I could have boosted the binder as it still fell apart a little in the middle. Doesn't affect the taste though! Mix all this in a big bowl. Mash into a loaf pan, but don't pack too tightly. 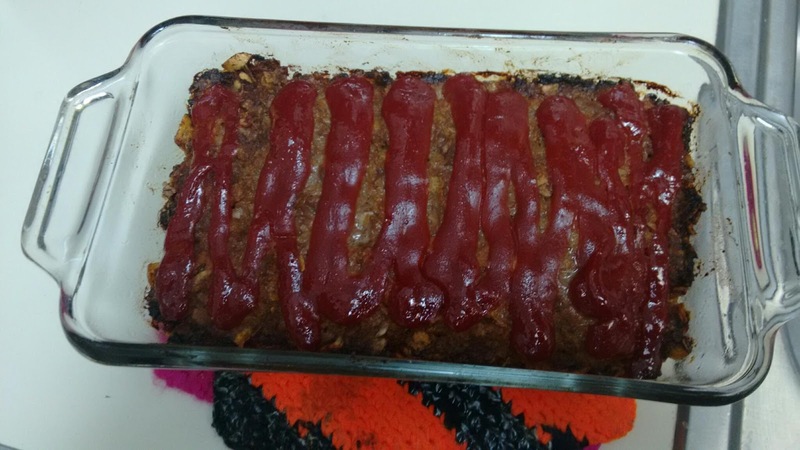 Squirt on thin layer of ketchup topping (optional but delicious) and bake about an hour until cooked through. Saveur recommends letting the loaf cool and making sandwiches on burger buns. It really is amazing -- add cheese and regular burger-type toppings WOW.